Toppings: (these are all optional). Step 1. In a non-stick frying pan, over high heat, brown the beef mince. Add the onion and garlic and cook, stirring often until the onion is translucent. Step 2. Add the taco seasoning to the pan and cook for 1-2 minutes. Add the water, tomatoes and pasta. Bring to the boil and reduce heat to a simmer. Cover and cook for 5-7 minutes or until the pasta is al dente. Step 3. Add the salsa, corn and capsicum to the pan and stir over heat for 2 minutes to warm. Step 4. Sprinkle cheese over the top and replace lid until the cheese melts. Serve with your favourite toppings. This one dinner is the real deal. It contains meat and three veg with pasta and a touch of dairy. The kids won’t even know it’s good for them. I have cheated and served this with a side of warm chips for the kids. They love using them to scoop up the mix. This Mexican Fish with Corn Salsa has that Mexican spice but less carbs. You could feed a crowd with this Chicken burrito bake. These Healthy homemade tacos are low in fat and high in salad vegetables. If you want to make your own taco seasoning then this Homemade taco seasoning recipe makes a large amount. These Oven tacos are warm and crunchy and worth making the effort. 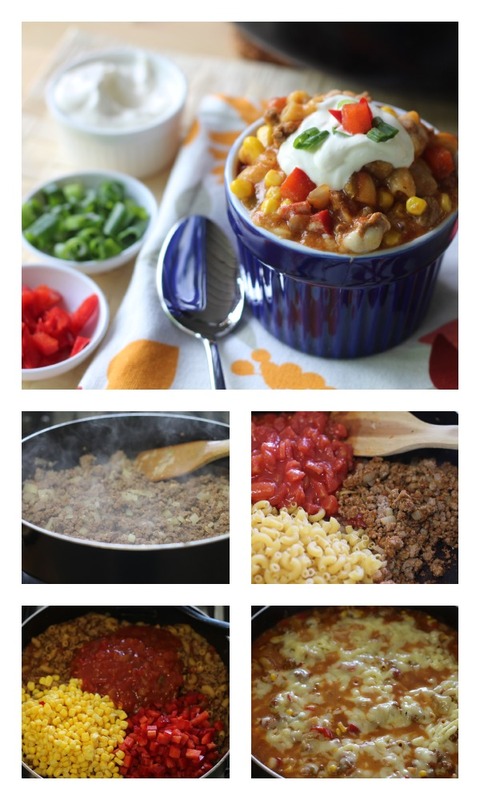 If you love lasagne then you will love this Taco lasagne for dinner. It uses tortillas instead of pasta. This Mexican pizza has all your favourite flavours but on a slice of pizza! If you need to come home to a warm meal then this Slow cooker taco soup will warm you from the inside out. If fajitas are your favourite then these Mince fajitas are so delicious and easy to make.